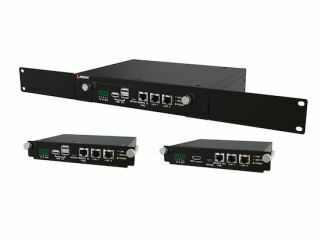 Arista Corporation has launched its RS-120 Rack Mount/Wall Mount/HDBaseT Extender/Computer. The new RS-120 is a 1RU rack mount unit available in three configurations: the RS-120-A07-TX (transmitter), the RS-120-A07-RX (receiver), and the RS-120-E01 (computer). With its modular design, the RS-120 was developed to minimize installation time and effort while also providing a significant maintenance advantage by way of its ability to swap the transmitter, receiver, or computer modules in seconds. Arista’s RS-120-A07-TX transmitter is equipped with the company’s ARD-1006-A07-TX HDBaseT transmitter module. The unit features an HDMI Loopback output, a 2-port 10/100 Mbps Ethernet pass through hub, an RS-232 port, IR control, plus Power over HDBaseT. The unit transmits video signals up to 4K/UHD with embedded multi-channel audio and remote power for the receiver. Equally notable, the RS-120-A07-TX provides integrator-friendly features such as IEEE standards-based PoE transmission for safety and compatibility. The Arista RS-120-A07-RX receiver is equipped with Arista’s ARD-1006-A07-RX HDBaseT receiver module, which can be powered by the RS-120-A07-TX transmitter via PoE or 12VDC input. The receiver features a four port USB 2.0 hub and a 2-port 10/100 Mbps Ethernet pass through hub, along with an RS-232 port and IR control. Designed as a compact, rack mountable computer to serve as a system controller, Arista’s RS-120-E01 computer is equipped with the company’s MicroBox-1100A-E01 computer module running Microsoft Windows. The system features an Intel Atom E3845 1.9GHz quad-core CPU and up to 8GB DDR3 memory. The accessible ports on the front of the RS-120-E01 include a four port USB 3.0 hub, dual Gigabit Ethernet, one RS-232/422/485 BIOS selectable COM port, a CFast slot, and a VGA port. The unit’s rear accessible ports include one HDMI port, one USB 2.0 connector, one RS-232/422/485 BIOS selectable COM port, an audio out jack, and a power on/off switch. Recognizing that various installations may want a combination of rackmount and shelf-mount solutions, The Arista RS-120 TX, RX, and Computer units also have a wall-mount mounting solution. This option enables the ARD-1006-A07-RX HDBaseT receiver module, for example, to be mounted on the rear side of a large format LCD display or onto a recessed space behind the video display which can help minimize installation time and effort. This wall-mount also provides maximum flexibility for upgrading or replacing the module.